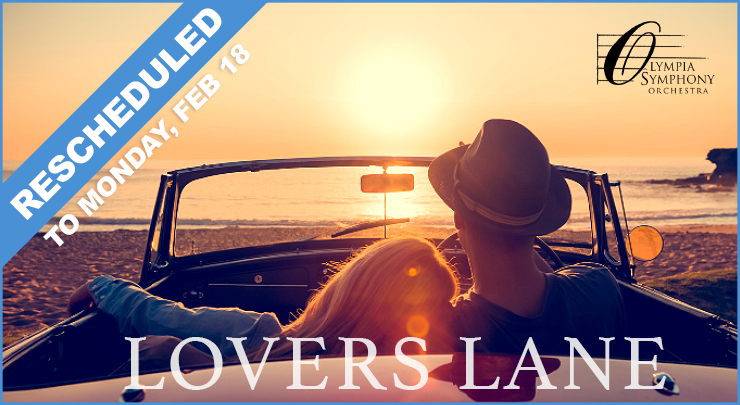 Due to weather and hazardous road conditions, the February 10 concert of “Lovers Lane” presented by Olympia Symphony Orchestra has been rescheduled to February 18, at 3:00 pm, at the Washington Center for the Performing Arts. Tickets for the February 10 concert will automatically be honored for the concert on February 18. If you are unable to attend the rescheduled date, we are happy to exchange your ticket for either our March 17 or April 28 concert. Call the WCPA Box Office during their business hours (Tuesday-Saturday 12:00-5: 30 pm; 360-753-8586) to reissue your ticket. In the event that none of these dates work for our patrons, we are happy to issue a refund. We apologize for this inconvenience, but the safety of our patrons and musicians is our top priority. Please stay warm and safe through this next week, and we hope to see you on February 18 at 3:00 pm. A post-Valentine’s Day concert features a trilogy of beloved favorites. Mozart’s zestful Overture to his opera The Marriage of Figaro raises the curtain on this matinee presentation. Local performer and musical icon, Robert Jorgensen, returns to the OSO stage for the lyrical and Romantic Piano Concerto by Edvard Grieg. The late-19th-century music by Brahms is considered to be the height of musical Romanticism and his last Symphony — the Fourth — is a rich and involved work in the lauded tradition of German music.